Having eaten in the Brighton restaurant Food for Friends a while back, I was excited to get my hands on their recipe book written by Jane and Ramin Mostowfi with Kalil Resende. And this is indeed a gorgeous book full of recipes with amazing depth of flavour and exciting ingredients. The book is also clear about which recipes are gluten-free or suitable for vegans. Many of the recipes are for special occasions only, as you will need to get in special ingredients and take some time over preparation. I was looking for a recipe to try which contained more everyday ingredients and I found Sweet Potato, Garlic and Rosemary Gratin. Now this recipe did require quite a bit of effort, not least in the extra washing up, but it delivered in terms of flavour, which was rich and rounded without being overwhelming. It was delicious in other words! The dish is supposed to finish up as a kind of cake which you cut into slices to serve. I didn’t manage that I must say, maybe I wasn’t diligent enough about pouring out the juices half way through cooking, which seemed a such waste to me! You may also have to be inventive with the instruction to use a second baking tray the same size, as most of us without restaurants don’t have that luxury! Still none of that affected the taste, so we were happy diners anyway! Preheat the oven to 180C / gas mark 4 / 350F. Blend the garlic, salt, pepper and oil together in a blender. Place the resulting mixture in a large container. 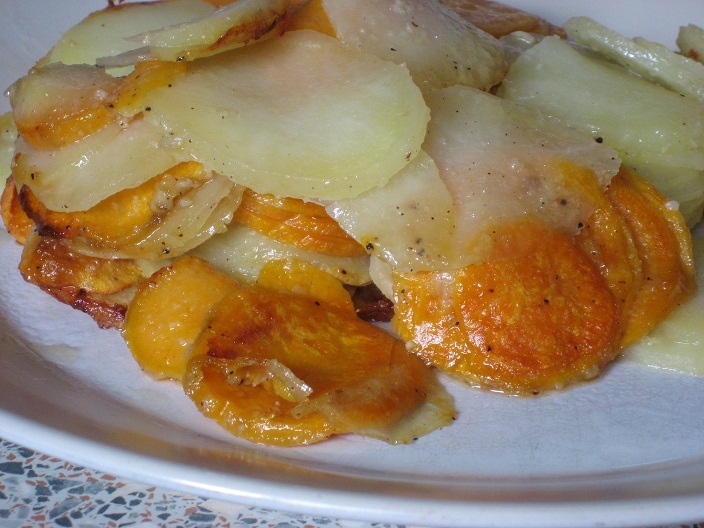 Finely slice the sweet and ordinary potatoes, and put the slices into the container. Add the chopped rosemary and thyme and allow the potatoes to infuse with the oil and garlic mix for 10 minutes. Line a 2cm deep baking tray , approx. 25cm x 15cm with baking paper. Put the potato mix in the tray, pressing it down into the corners to make sure that there is an even amount across the tray. Cover the surface with another piece of baking paper and cook in the oven for 35 miutes. Take it out of the oven. Get another tray the same size and press down on top of the gratin to squeeze out excess juices, tip the trays to allow them to drain. Then put the gratin back in the oven for another 20 minutes or so, until golden in colour. Check the middle with a knife to see if it’s cooked. Turn the gratin upside down ove a choppping board and lift the tray off. Then carefully remove the paper and trim the edges. What is it with Parmesan? I’ve often wondered why it is that top chefs are so ignorant about food. I’m talking about vegetarian food in particular of course, so it could be a deliberate ignorance! 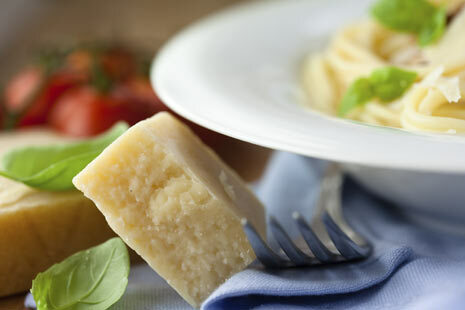 But Parmesan cheese turns up so often in restaurants and recipes as being suitable for vegetarians that the UK Vegetarian Society are currently running a campaign to tell chefs that Parmesan is never suitable for vegetarians! It’s not a difficult concept. Vegetarians don’t eat products that come from dead animals. Parmesan cheese is made with calf rennet. A lot of cheese is made with calf rennet, but because Parmesan has an EU Protected Designation of Origin, it must always be made with animal rennet or it cannot be called Parmesan. You can always get vegetarian parmesan-style cheese, check out this one from Bookhams, or use a similar vegetarian hard cheese. Of course as a vegetarian eating in a restaurant it’s possible avoid dishes containing parmesan or ask for it to be left off a pasta dish for example. But that’s not so easy if you’ve been invited to a friend’s house for a meal and they’ve gone to the trouble of seeking out and preparing a vegetarian recipe, only for the meal to contain Parmesan. That’s why it’s so important for recipe writers to get it right. All round though, chefs of the world, it’s not hard, so just get it right! Well here’s a recipe that does get it right from the cookery school at the lovely Demuth’s restaurant in Bath. 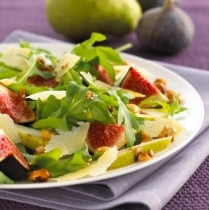 Ripe, fat juicy purple figs are essential for this salad and do be generous with the parmesan. This salad needs to be prepared, just before eating otherwise the pears will discolour. To help prevent the pears discolouring, toss the sliced pears in a little lemon juice. To make the salad, arrange the rocket leaves on a serving dish. Mix in the figs and pears. Shave thin slices of parmesan with a potato peeler and sprinkle over the salad. Tips: The amount of figs to use does depend on their size. Just make sure they are unblemished and perfectly ripe. Vegetarian parmesan is available in wholefood stores and most supermarkets.